A few months ago I came up with a squat routine that, as far as I know, exists nowhere else. I’ve tried it a few times now, and I really love it. I call it the 100 Reps Squat Routine because, as its name implies, this routine involves performing 100 squats. These are the weights I use. Pick carefully and go conservative (light) the first time. Catch your breath for 20-30 seconds, then proceed. 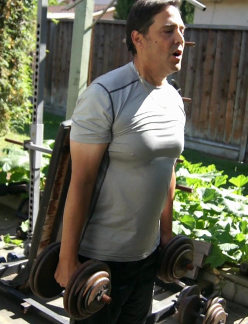 Do another 10 reps and immediately put those down and pick up the next heavier pair. 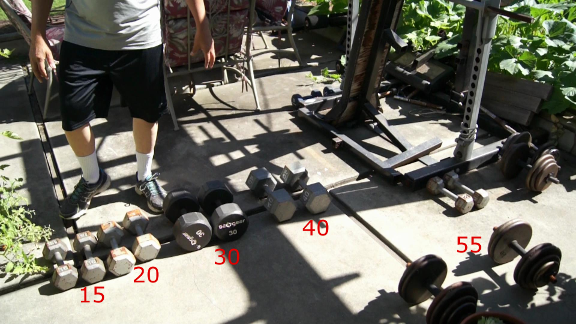 Keep repeating the sequence (steps 1-4) 3 more times until you have gone through all 5 pairs of dumbbells. At this point you’ve done 50 squats and, if you’ve done them properly with the right amount of weight, your heart will probably feel like it’s about to come out of your mouth and your breathing will be very hard. Take a two minute break. Now repeat the whole thing in reverse, starting with the heaviest pair of dumbbells and working your way down. The bottom of the squat. Keep your back straight and head up looking forward. Keep your form good, with an even tempo going up and down. After you’re done, do a 1-2 minute cool-down by walking around and doing some light stretching…but keep it light. You need to let your system recover. That’s it. By the end, you will definitely be winded, your heart will be thumping, and you will be perspiring heavily. And you will have kicked up your metabolism for more than 24 fat burning hours (yay!!). This is a very strenuous, albeit short, routine. Check with your doctor before doing it. I have measured my heartbeat at over 165 bpm doing this. If you’re not sure, start with lighter weights. This is a short but intense workout that you can complete in less than 10 minutes and still get fantastic results. The PDF gives you a complete description of each exercise, and includes a tracking sheet. You can adjust this for your particular level of fitness from beginner to extreme. No gym and no gear! It works! 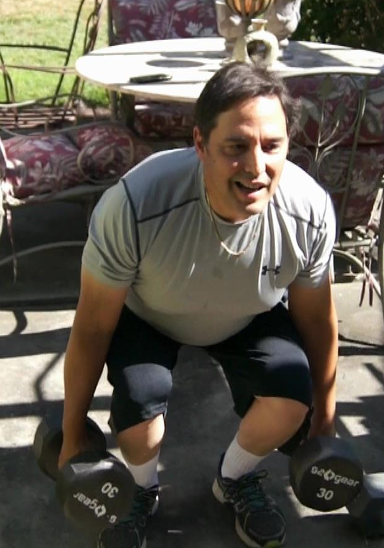 It is possible to get fit at any age regardless of your current level of fitness. CLICK HERE to learn how.